What is Magento PWA (Progressive Web App) studio & How PWA Works? Magento Commerce is a global leader in cloud digital commerce innovation. 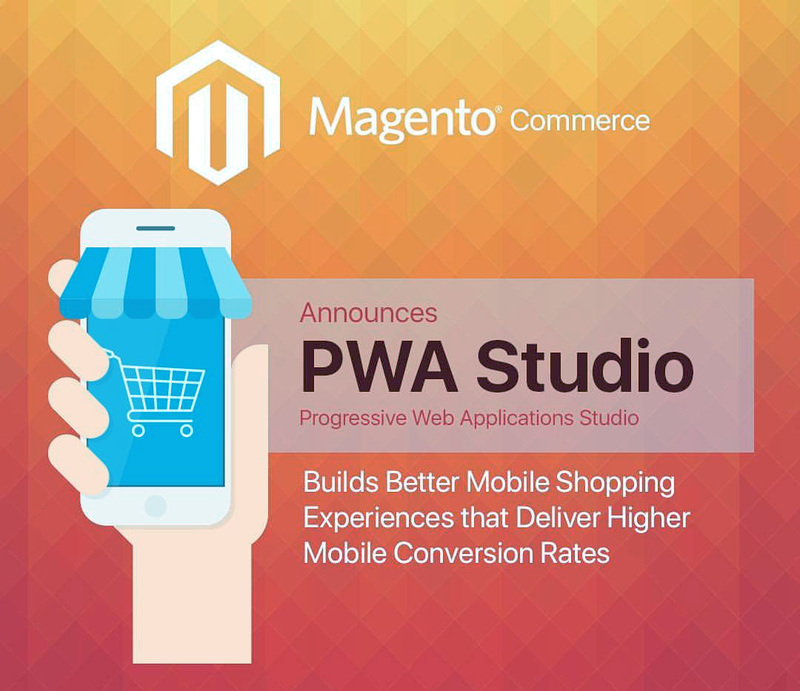 They have made a significant change and announced Magento Progressive Web Applications (PWA) Studio, a software suite for building online stores with app-like experiences. PWA Studio has immense benefits and allows Magento Commerce solution Partners and UX developers to provide the authentic, fast, and simple front-end experiences on mobile devices. 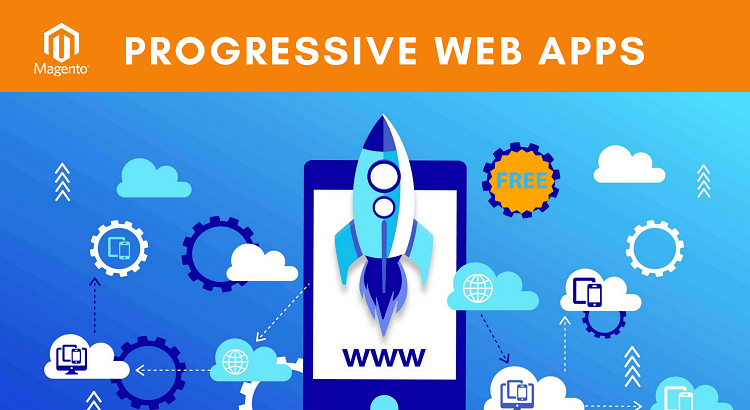 In 2015, a Google engineer Alex Russell proposed a new kind of web application called PWA (Progressive Web Applications).PWA is basically the web applications that can work offline, and to be precise, in the background as well. Service workers have transformed the entire scenario. “Service workers” are workhorses, which run and work in the background and are linked with pulling in notifications, cache material, and store data. PWA is really advantageous as they do not show the Chrome thing, no address bar, and are really data-friendly. What makes them disparate is that they do not crash when network or Wifi signal gets lost. PWA is the champion and master of all applications when there is no wifi or data available. One can download it anytime, anywhere. It is very easy and ideal to use just like a browser and one can download easily just like a native app even without a data connection. Service Workers new content is cached and local changes are synchronized to a local server. Once you’ve accepted the terms & conditions, they will send you push notifications as well. It is really costly to maintain the applications. Applications like Android, Apple, and Windows Store would take at least $45,000 to $50,000 for maintenance as it requires constant monitoring, frequent bug fixes, and monumental upgrades. PWA does not require hefty amounts for maintenance. PWA is disparate as it has a layer called Service Worker in between the website and the internet which routes all the browser requests and displays the desired results. PWA adds a feather to the cap as there is no need to update the content manually. It updates the content automatically and always displays the fresh content in front of the user. This happens by allowing the service worker to serve all the pages on your website that are stored in the App Shell for quick and updated retrieval. Service worker is the one that shows the user with the latest information, updates, and content. The unique and fresh content is again stored in the App Shell for responding to the user requests rapidly. Mobile is a significant component these days because of the mobile-first approach. Almost everyone is having a smart phone in hand and hence, Mobiles are the top investment tool by the managers across the world. There are some hard facts which make reality completely contrary. As the rate of cart abandonment among mobile users is still more than 80%. PWAs are in the limelight and have served as a perfect solution to the retailers who do not have high marketing budgets forcing users to save their mobile websites. When a user visits your website; the browser recognizes it to be a PWA website and prompts notification for automatically adding it to your home screen. This is beneficial for both the ends equally and greatly. Your purpose of getting your mobile website saved on the users mobile is fulfilled and the user can have a quick shortcut in the form of an icon on his home screen without having to go to app store and download manually. The other benefits include that when added to their home screen they can use it as a standalone app on their mobile. PWA’s are an alternative to responsive and fully functional websites and are a boon for the retailers. They can offer the speedy and application-like experience to their users along with added and unbeatable advantages of pushing notifications for latest updates of content or newly added products. They make your website interactive and highly engaging. Another advantage that PWAs have is that of getting an SEO boost. It is a cutting-edge technology which is promoted and persuaded for use and the adopters shall be rewarded with optimization benefits. The foremost and supreme provider of cloud commerce innovation to the major brands across B2C and B2B industries, with more than $155 billion in gross merchandise volume transacted on the platform annually is Magento Commerce. Also, Magento Commerce enhances the merchants to successfully incorporate the digital and physical shopping experiences. Magento Commerce is the #1 provider to the Internet Retailer Top 1000, the B2B 300 and the Top 500 Guides for Europe and Latin America. Magento Commerce is supported by a vast global network of solution and technology partners. It is a highly active global developer community and the largest e-commerce marketplace for extensions available for download on the Magento. Mobile Commerce is boosting at an expeditious rate. It is expected in the foreseeable future that it will contribute to half of overall retail sales growth by 2022 according to Forrester. The current scenario is that merchants are struggling with the low conversion rates and complexity of building and managing multiple disconnected experiences. The recent study and analysis have revealed that consumers only download and use mobile apps for the brand they use frequently and so that they can have social interaction. The major advantage of PWA is that it amalgamates the best of the website and mobile app functionality so as to provide an authentic, expeditious, and interactive experience that can boost the conversion rates by upwards of 50 percent and drive strong revenue growth for brands. It is expected in the upcoming future that PWA in Magento will provide the developers and online traders with the essential tools they need in order to compete in the cut-throat competition and deliver the convenience and utility of a mobile app combined with the searchability and buying experiences they get from their desktop experiences. Mobile is an important aspect of driving the traffic and boosting the sales for businesses like hand-made smartphone accessories. It is essential that we provide our customers with a fast, seamless experience to reduce frustration at the point of sale,” hence, it is an important aspect to provide the customers with a rapid and smooth experience. According to John Webber, Founder of Carved. “Our investment in PWAs has not only transformed the buying experience for our customers, but it’s made a tremendous impact on our bottom line allowing for a 33 percent reduction in bounce rates and 75 percent increase in our mobile conversions.” Hence, PWA in Magento commerce will act as a good fortune for merchants and retailers.